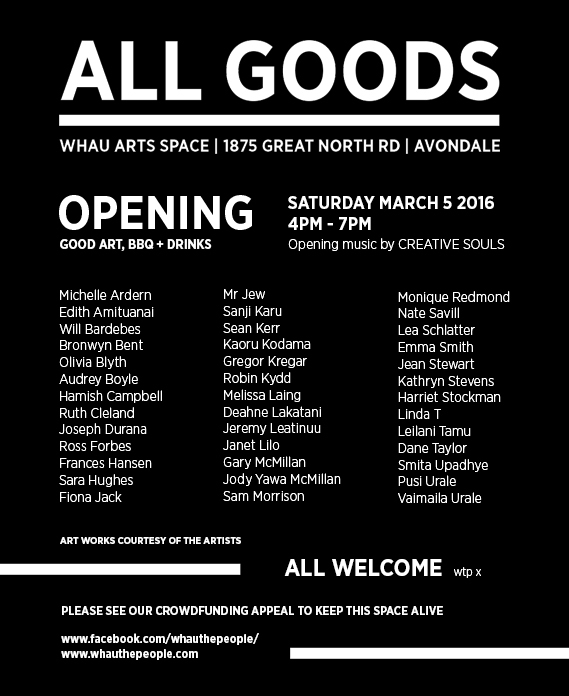 All Goods | Whau Arts Space was an empty building in Avondale we occupied from February 2016 – December 2016. With the support of our local creative community and neighbourhood, it was transformed into a Community Art Space. A place for people. about : For the past years, we, Whau The People, have worked with numerous collaborators to stage the Whau Arts Festival, an annual four-day-long neighbourhood event featuring poetry, street art, tattooing, blacksmithing, lip-syncing, theatre, dance, installations, sculpture and more. In working out the programme for such a wide array of projects, we have at times grouped ideas under the headings of ‘Firecrackers’, ‘Mists’ and ‘Rocks’. These terms indicate a welcoming of all types of creative expression; activites that might last a moment as well as activities that live well beyond the festival dates. It is a broad gambit of arts — and their makers — that this neighbourhood space All Goods is committing to championing. 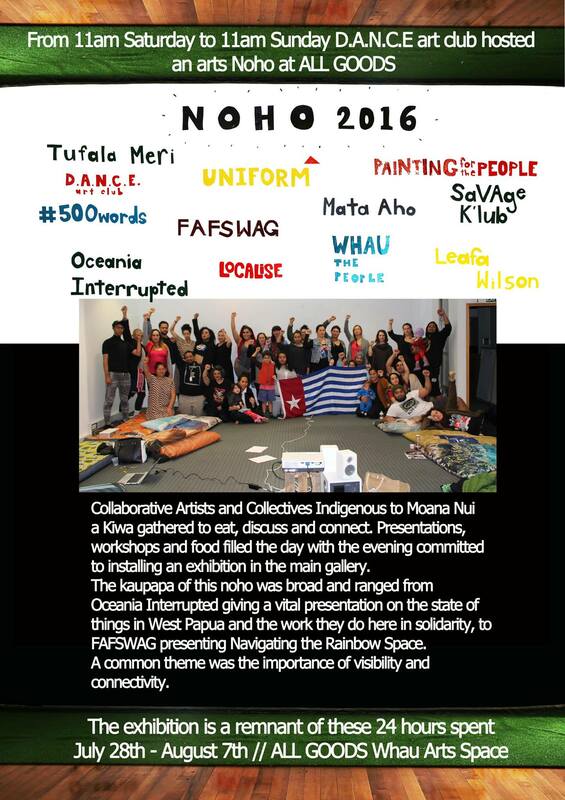 Our inaugural exhibition featured artists living in the Whau area as well as artists living further afield who have previously been involved with Whau The People projects. From painting to photography to moving image and sculpture, this exhibition offers a taste of local artistic diversity and celebrates the rich talent that can be found within our own communities. All Goods was possible due to the support of a local businessman and landlord, who we arranged a lease agreement with for a key location in Avondale town centre. But there were still bills to pay, so we ran a crowdfunding campaign through PledgeMe. On offer for supporters were special mini-artworks, t-shirts and recycled billboard cushions. The campaign closed on the 11 March and raised $10 000. We’re going to open and run a neighbourhood arts space in Avondale, Auckland, that will be a hub for all sorts of excellent creative activities from bonsai through to painting through to karaoke. Building on the success of a range of recent art projects in the area, this will be a space that can host exhibitions, performances, workshops, talks, screenings, meetings, parties, a children’s gallery, and everything else in between. We’re working hard to make as many of these as possible free for people to take part in. We’ve been given an amazing (we know that’s an overused word, but really it is) opportunity to take on the lease on a key building in the Avondale main street. Thanks to the support of a local businessman, we’ve been given a greatly reduced rent which means this is possible. We all live around the area, and like it here, and think that a space like this will be a real asset to the area. We’re keen to have a space where flash award-winning artists feel just as home as the seven year old that’s never seen a real painting before, and our previous projects have all been a part of trying to embed interesting artistic projects within the wider community. For the past two years, we, Whau The People, have worked with numerous collaborators to stage the Whau Arts Festival, an annual four-day-long neighbourhood event featuring poetry, street art, tattooing, blacksmithing, lip-syncing, theatre, dance, installations, sculpture and more. In working out the programme for such a wide array of projects, we have at times grouped ideas under the headings of ‘Firecrackers’, ‘Mists’ and ‘Rocks’. These terms indicate a welcoming of all types of creative expression; activites that might last a moment as well as activities that live well beyond the festival dates. 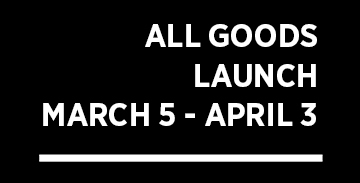 It is this broad gambit of arts — and their makers — that the new neighbourhood space All Goods is committing to championing. 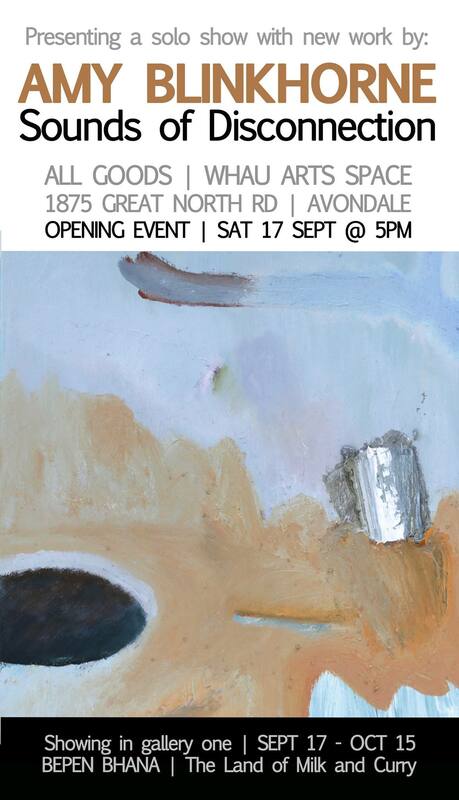 Our inaugural exhibition features artists living in the Whau area as well as artists living further afield who have previously been involved with Whau The People projects. From painting to photography to moving image and sculpture, this exhibition offers a taste of local artistic diversity and celebrates the rich talent that can be found within our own communities.